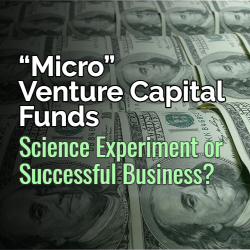 Micro Venture Capital Funds: Science Experiment or Successful Business? You are here: Home / Industry News / “Micro” Venture Capital Funds: Science Experiment or Successful Business? For decades, the classic venture capital fund has served as the dedicated investment route for funding startup businesses. In recent years, we have seen a marked rise of “micro” venture capital funds, which are funds with less than $50 million in committed assets to invest and frequently have between $5 million and $15 million to invest. In the aggregate, hundreds of such funds have been formed and represent a potential significant amount of capital to be deployed at the macro-economic level. In this article, the first in a four-part series, we address the core issue of the economics to the fund sponsor. Related important topics will be addressed in future issues. Investment funds are typically organized as private investment partnerships. Revenue for the sponsor (also known as the general partner) is generated in two primary ways: a management fee and a carried interest. The classic formulation for VC funds is a 2 percent annual management fee and a 20 percent carried interest. Of course, in our free market economy, sponsors of funds are able to meet market demands and adjust appropriately. The extraordinarily talented VC investment fund sponsor may command a carried interest of 30 percent or more, with different tiers based on returns. Other sponsors, who are trying to build a track record, may accept little or no carried interest, and management fees may dip to as low as 0 or to 25 basis points. The problem for a micro VC fund, in this context, is whether the management fee provides enough current cash for the general partner to afford a basic lifestyle, particularly while capital is being deployed and investments are not realized. The problem is exacerbated when the sponsor needs to have a functioning team of investment and other professionals frequently demanded by investors: revenue of $200,000 on a $10 million fund (the 2 percent formulation) does not go very far. In recent years, the following five common solutions have taken root. Sponsors of micro VC funds are able to argue successfully to their prospective limited partners that their management fees have to be larger than 2 percent, particularly during the early years. Whether the bump is to 2.5 percent or 3 percent or even more turns, in part, on the budgeted cash flow needs for the team. The parties negotiate whether the fee steps down over time, even during the investment period, based on assets raised above or below 2 percent. Micro VC fund sponsors have become skilled at identifying those expenses that should be borne by the fund itself instead of the general partner. At a high level, the securities regulators want to ensure that investors are clearly and directly shown the expenses that will be passed through to the partnership, so it is critical to enumerate the expenses with particularity. But if the contract is specific in terms of costs to be paid by investors, in our experience it typically survives scrutiny. Apart from normal SG&A, many general partners of micro VC funds pass almost every other investment-related expense through to the fund. Sponsors have the carried interest “lever” to adjust along with the management fee, depending on their short-term cash flow needs and their future expectation (or hope) in their investment results. Larger management fees may be counter-balanced against lower carried interest levels, or preferred returns (common in private equity funds but not standard for venture funds), or hybrids. Depending on the particular investment strategy, a micro VC fund sponsor may focus on whether there will be co-investment opportunities for investors that can yield incremental revenue and opportunities to earn a carried interest. Those who wish to form and run micro VC funds have gotten so comfortable that they need to play the long game. First-time fund managers may conclude that the only way to incubate a track record is to sacrifice short-term annual economics. Such managers also have concluded that a smaller first fund with successful results will likely yield larger future funds. Our next article in this series will focus on some unique challenges faced by micro VC funds in getting capital to work. Co-Chair of the firm’s Emerging Companies and Venture Capital Practice Group. 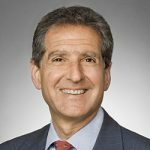 He has more than 30 years of experience as a corporate lawyer, with expertise in venture capital, private equity, fund formation, M&A, and corporate governance matters. Ryan Conner is an associate in Morrison and Foerster’s San Francisco Office. His practice focuses on the representation of startups and emerging companies throughout various stages of their life cycles.